OK, I know it’s hard to listen to someone who names their child Moonbeam but go with me on this for a few minutes. 1. Artificial intelligence is not something out of a Terminator movie! It’s clear in many fields of endeavour – from defence to retail to energy to healthcare – the rise of immense computing power is on the verge of changing much of what humans do. We were lucky enough to listen to the ‘two Nathans’ at City of Hope who shared how they’ve jumped right into what they properly call ‘machine learning’ and have begun to create machine learning applications to create what they call predictive philanthropy. There’s no doubt that we’ve created a problem in the social impact marketing space – lists. Big lists of lots of supporters who may or may not have the potential to give much more. Traditionally, we’ve done data audits or analysis that are handed over to our staff. The analysis lays out giving potential that is dated from the moment it’s received. For City of Hope – and other organizations who are exploring the predictive philanthropy that comes from machine learning – they will have an ever-learning partner to give them new predictive opportunities that they can act upon e.g. visit/call. It’s a big new world with machine learning, let’s jump in together. It’s a sad but powerful reality that the omnipotent computing machines in our hands influence so much of who we are and what we do, and it’s growingly important in philanthropy and in healthcare. For some Scandinavian countries, over 50% of all healthcare consultations (e.g. checking biometric reading) are done through someone’s mobile phone – not in a doctor’s office. And did you know that when you go to sleep at night and leave your phone on to charge, marketing organizations are using the stillness of your phone for multiple hours to tell them where you live and apply marketing techniques with that information? This may now make you turn your phone off at night, but it should also remind you that healthcare marketers need to open their minds to the wealth of opportunities that the mobile phone gives us to learn more about our healthcare consumers and donors. It’s not just NIKE or Adidas or an NBA team that project brands that make the hair on the back of your neck stand up. For healthcare institutions to stand out – to find new customers or to find new donors – they’re changing how they are talking to their marketing about themselves. They’re not asking people to give or sign up; they’re asking them to join a movement. 4. Design thinking is here to stay. The commercial sector quickly applied the discipline and thoroughness of CX Design Thinking to their customer’s journeys. Places like the Stanford Design School’s approaches to journey mapping were adopted by companies like Oracle and Microsoft and this ‘structured empathy’ approach make incredible improvements to the customer journey. It’s only now that this approach is being adopted by the healthcare marketing sector to improve patient journeys and supporter journeys. We’re five years behind and it’s time to catch up! Keep these tips at the forefront of your healthcare marketing strategy and you will become that parachute for your healthcare institution! 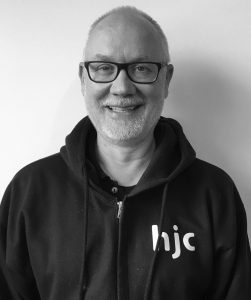 Mike Johnston is the Founder and President of hjc, and has over 28 years’ experience helping non-profits maximize their fundraising potential. He is the author of 4 books on technology and integrated marketing and fundraising and has raised over $2 billion in 20+ countries around the world. Mike is a hockey fanatic, comic book enthusiast and an expert in the Japanese Imperial Navy: 1939-1945.